A simple lunchtime meal could look drastically different without bees. We can thank these pollinators for about one out of every three bites of food we eat, including many of our favorite fruits like blueberries, peaches, blackberries, grapefruit, raspberries, oranges, pears and plums. As pollinators, bees flitting around apple orchards and cranberry bogs move pollen from the male parts of trees and plants to the female parts. This shift of pollen allows the flowers to produce fruit. Many crops, like almonds, avocados, cucumbers and even onions, wouldn't produce much, if anything, without the help of bees. In the U.S. alone, bee pollinators annually contribute to about $20 billion of products people use every day. Recent scientific studies show that bee pollination is directly connected to human health. People need to consume a variety of nutrients to stay healthy. Globally, the crops that provide these nutrients vary widely from place to place, with developing regions of the world being more dependent on particular fruits and vegetables than others. Were these crops to fail on account of a decline in pollinators, it could result in a global malnutrition problem. Unfortunately, researchers have seen declines in the success of wild and commercial bee colonies over the past 50 years. This drop in bee numbers in the U.S. is attributed in part to an increase in private and commercial pesticide use. Other conditions contributing to the struggling numbers are habitat loss due to development, monoculture agriculture (growing just one crop, like corn, year after year), animal grazing and the introduction of non-native insect species. Cumulatively these conditions have crop farmers concerned about whether there will be enough honeybees to pollinate their fields, and beekeepers concerned about collapsing honeybee colonies. Despite the challenges honeybees are facing, there is hope. Scientists confirm that the diverse ecosystems found on organic farms provide friendly places for bees to nest and roam. Organic farmers often grow more than one type of crop which provides bees with a varied and nutritious diet, and they don't use the types of synthetic pesticides that have been connected with bee population declines. Organic farms are helping the bees that eaters rely upon for meals every day, whether a person chooses to eat organic food or not. Though the plight of bees may seem overwhelming, there are steps people can take to protect these precious pollinators. Support organic farms. By choosing organic products over conventional counterparts you can limit the amount of pesticides being used for commercial crop production. Buy untreated seeds and seedlings. Neonicotinoids are insecticides applied to seeds and soil that can persist in the environment, rather than degrade. These chemicals are connected to bee colony declines. Instead, opt for organic seeds and seedlings when prepping for your coming gardening season. Support small, local farms. Small farms tend to be more diverse in their fruit and vegetable production, and that diversity is associated with the presence of more pollinators—like bees! Plant a garden for pollinators. Set aside space in your yard or garden specifically for native flowering plants that help provide food and shelter for bees, butterflies, and other pollinators. But be aware that even plants marketed as “bee-friendly” are often treated with neonicotinoids. Ask nursery staff or check the label to find out if plants have been treated. Start a hive. Provide bees with nesting options in your backyard. The University of Minnesota offers a tutorial for how to build different types of homes for bees. Learn more. Watch Queen of the Sun—a movie about the global bee crisis. 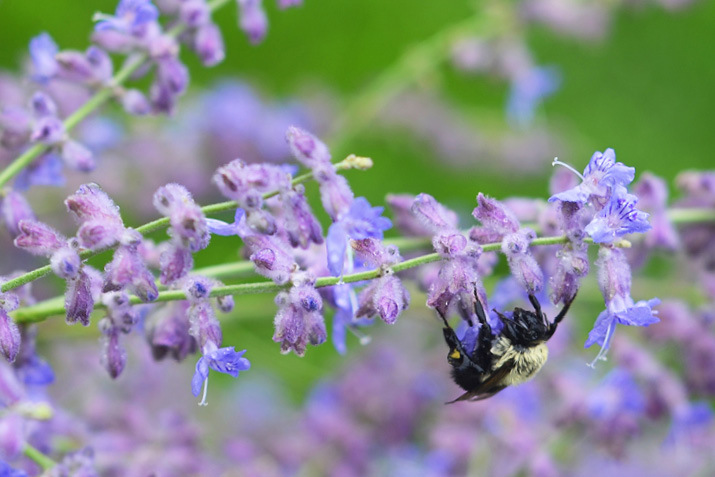 Educate yourself and your friends with the help of The Xerces Society, a non-profit dedicated to the health of bees and other invertebrates.